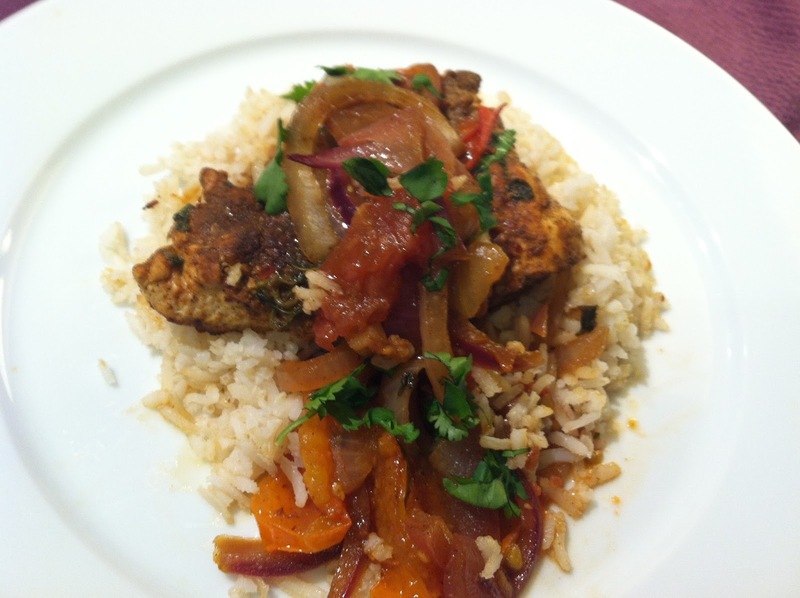 This is a great meal to prepare when you are in the mood for some healthy, spicy food! All of the spices and herbs used create such a delightful flavor and the spices add the kick you are looking for without all of the fat! I chose an organic brown rice for the side dish as a nice compliment to the spiciness. Here is the recipe. Please write back your feedback. Enjoy! cumin, paprika, red pepper flakes, pepper, salt, and ground coriander, and parsley. After pounding out the chicken, rub the mix on both sides of the chicken with the mix. Heat the oil in a skillet. When hot, add the chicken and cook over medium/low heat for 5 minutes. Turn chicken over and cook an additional 4 minutes. Remove to a platter and keep warm. To the same skillet add the sliced onion and cook for 1 minute. Add the garlic and cook one minute. Add the wine and cook for one minute. Add the tomatoes and add the chicken back in. Cook for 4 additional minutes. Serve with the brown rice and garnish with the cilantro.